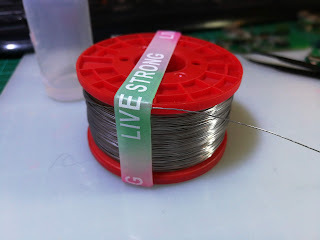 I just bought at Farnell some really good and really thin solder wire for small jobs. The issue is the roll does not hold the wire coils enough si it keeps on creating knots. I finally came down to this simple idea, which makes use of an elastic band that was offered by a random Chinese reseller, but a regular wide elastic band is probably as efficient. Just pull the last unwound wire under the band and it will hold the coils in place.